High filtration performance-3-5 micron removal. High capacity filtration throughout the entire nextsand bed depth provides more than twice the capacity of multimedia filtration. High flow– 3-4 times that of multimedia with superior filtration. Long lasting media (>5 years) not consumed in the process. Municipal Water Treatment, pressure and gravity filters–higher fl ow, lower pressure drop and superior filtration performance. The WECO Backwashing filter with next Sand is a specialized Point-Of-Entry (POE) system for municipal and well water supplies. next Sand consists of Clinoptilolite, which has superior performance properties over regular filter sand or multimedia combinations. next Sand is mined in the Western United States. The mineral is then precisely processed and graded to produce a hard, stable filter media with a high surface area and micro-porous character. This is a light-weight filtration media with many valuable functions and properties related to water treatment and remediation. next Sand media has a very high surface area which filters out particulate matter down to three microns. This is an ideal media to use for removing Totals Suspended Solids (TSS), turbidity and sediments like sand and oxidized mineral particles. next Sand also has a higher flow capacity, typically three to four times that of multimedia. This higher flow rate means a greater performance can be achieved from existing vessels when upgraded with next Sand. This filter media isn’t consumed in the filtration process. A simple periodic backwash will keep the media clean and operating efficiently for five years or more. Ferrous iron is invisible in water until it reacts with oxygen and precipitates as ferric iron particles. Iron can foul water softeners and other ion-exchange resin filtration systems. Iron will also reduce the efficiency of reverse osmosis filtration systems. Iron particles clog shower heads and faucet aerators. Iron is known to foul and damage water-using industrial and medical equipment. Particles of suspended solids that include sand grains, mineral scale and biological contaminants like insect fragments will damage filtration systems, filter screens, automatic valves on boilers, commercial washing machines and food processing equipment. Water enters the top of the tank through the Fleck control valve and passes downward through the next Sand filter media, which removes impurities. The WECO backwashing filter will clean itself periodically by rinsing away impurities it has filtered from water. When the filter medium is saturated with contaminants, the control valve automatically starts the backwash and regeneration process. The backwash procedure is an operation where water passes backward through the filter media at a fast flow rate. It enters the tank at the bottom through the riser tube, then flows upward through the filter medium, exiting at the control valve and sent to waste. The rapid, turbulent upward waterflow, in addition to flushing away particulate matter, loosens and resettles the media bed, preparing it for another filtration cycle. The treated and conditioned water enters the riser tube at the bottom of the mineral tank, passing upward and exiting the filter through the control valve. 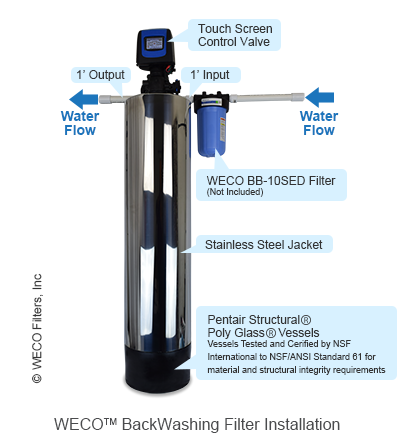 The WECO backwashing filter with next Sand is available in a variety of sizes. The filter can be operated stand-alone or in conjunction with other filtration processes. Please contact WECO Technical Support for expert assistance sizing and configuring your filtration system. Water pressure can cause leaks and damage the surrounding building or fixture if not properly installed. User mustcheck all fittings for tightness. WECO assumes no responsibility for water damage due to leaks. Order watert check with Pesticide Option from national Testing Laboratories Ltd.